I’ve always been a big believer in the “you’re as old as you feel” mentality, but the truth is there’s a lot of ageism going on. It’s in the fashion world, the beauty world, and most problematic, the workforce where it’s particularly scary because it greatly impacts one’s ability to provide for themselves and continue to stay and feel vital. It’s been trending for a while now. Older Americans have been getting non-surgical aesthetic procedures and cosmetic surgery to stay competitive in the job market, whether they’re seeking employment or trying to hold onto their present jobs.Though qualifications and experience for a specific job should be the deciding factor, unfortunately that’s not always the case. Right or wrong, consciously or subconsciously, if a present or potential employee looks old that could be a strike against them, especially if they’re up against someone with similar qualifications and experience who looks bright eyed and alert. It’s a fact of life. As you age, your skin loses its elasticity and can look less taut. You might experience wrinkles, drooping lids, hollow cheeks and even appear tired, worried and older than your actual chronological years. If you think plastic surgery might give you the competitive edge you’re looking for or at least even out the playing field, a consultation with a board certified plastic surgeon can help you decide what might be the right choice for you. Even if you’re not ready, willing or able to undergo a full, upper or lower face lift, short of plastic surgery there’s still a lot you can do to address different concerns you might have. If you have crow’s feet, forehead lines, the 11s or turkey neck, Botox can help. It will temporarily paralyze the small muscles, prevent new lines from forming and diminish the look of those you already have. If age spots have got you down, a series of microdermabrasion and/or chemical peel treatments could greatly diminish them or you can use a laser to zap them into oblivion. If you have under-eye bags, dark rings or circles consider hyaluronic acid filler which can trigger new collagen production and give your under-eye area a more youthful appearance. If you have marionette lines around the mouth hyaluronic filler could be the answer as well. It can be injected near the cheekbones and temples to fill out facial contours, giving you a more lifted and youthful look. If anything about your appearance does give you cause for concern, it’s nice to know you’ve got options. 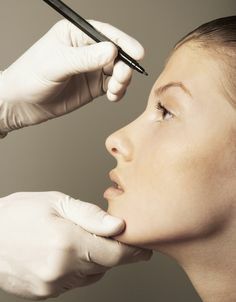 Most importantly, make sure you’re in the hands of an experienced board certified plastic surgeon. To find one in your area, click here.